PRO Scientific high shear homogenizers are effective at breaking down the various agricultural waste products such as cornstalks, poplar trees and switch grass. 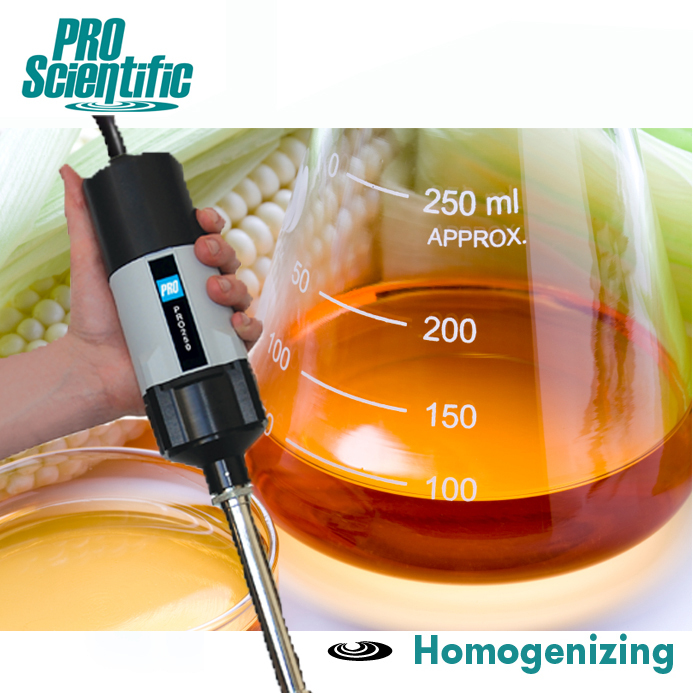 Depending upon the sample size we can pinpoint the exact ideal motor unit and probe, but most application can be handled with a PRO250 homogenizer with either a 20 or 30mm generator probe would be most ideal. While our high-shear mechanical homogenizers can breakdown to a submicron level, some customers might find it advantageous to consider our DPS-20 Dual Processing Automated Homogenizing System, either because they want to break down further than we can with a high-shear homogenizer and/or they have a higher throughput need that automation of the process could address. The DPS-20 Dual Processing System simplifies sample preparation by combining mechanical and ultrasonic (sonication) homogenizing and sonication into an automated, compact, noise controlled unit. Its unique design allows the use of each homogenizing method dependently or independently of each other within a programmable or manual mode. The automation of this system allows for repeat processing and consistent results, which frees up a large amount of valuable lab time. If your particular application would not benefit from Dual Processing Homogenizing than either homogenizing method made be turned off. This allows the DPS-20 to function as three separate automated systems, Automated Mechanical Homogenizer, Automated Sonicator or Automated Mechanical and Ultrasonic Homogenizer. When an automated system is not needed, PRO Scientific manufactures a variety of hand-held & post-mounted homogenizers with the ability to homogenize various volumes (.03ML to 20L) at speeds of up to 30,000 RPM.